Jack Zhang interviewed Seamus Whelan, a leader in the campaign to Stop the West Roxbury Lateral pipeline (SWRL) and a Socialist Alternative (SA) member. More info can be found at SWRL.info. Zhang: What is the West Roxbury Lateral pipeline? Whelan: It’s a proposed five-mile-long, high-pressure gas pipeline that will take gas from the longer Algonquin pipeline. This gas, extracted from fracking in Pennsylvania, will cross four states, and the WRL segment will take it to the Boston market. Zhang: How will this pipeline affect the community you live in? Whelan: This type of pipeline and the associated metering and regulating station is totally inappropriate for this densely populated urban neighborhood that has a number of schools, playgrounds, nursing homes, stores, and churches along its pathway. The pipeline explosion in San Bruno, California, caught that community completely by surprise. That pipeline had only half the pressure of the proposed Boston line, and it destroyed a 15-block area with eight fatalities and many more seriously injured. Zhang: As a socialist, why are you opposed to this pipeline? Whelan: I am concerned first with the safety of my own family and with the safety of my neighbors and my community. As a socialist, I also have serious concerns about the environment, global warming, and the future of our planet. Zhang: What role can SA play in advancing this campaign? Whelan: The message we have brought to the campaign is that as a community we must get organized and that we can’t depend on the courts or the political establishment to stop this pipeline for us. We must do it ourselves by building the strongest possible grassroots campaign and by linking up with other groups and campaigns that are fighting battles on similar issues. Socialist Alternative has given support and materials to help the campaign and brought to it the national and international experience gained from many other grassroots and electoral campaigns. Zhang: How can the campaign organize a fight-back? Whelan: By shining a bright light on this insane pipeline. We are starting to knock on thousands of doors, hold regular community meetings attended by hundreds of local residents. From these meetings, we are organizing rallies and actions. 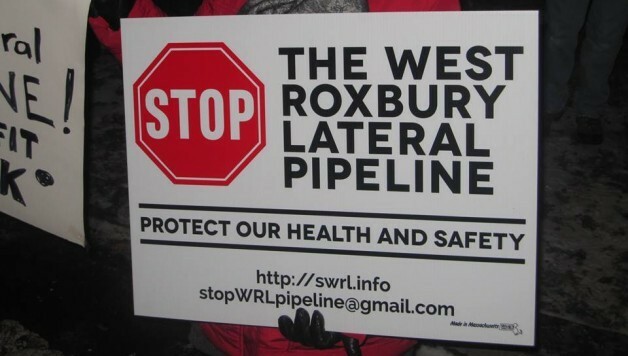 As West Roxbury begins to find out the truth about Spectra Energy’s fracked gas, there is a growing anger and willingness to stop the deadly pipeline.